As Miranda moved through the house, putting away a load of laundry, picking up the glass her mother left in the living room the previous night, straightening the magazines on the coffee table, removing a few dead flowers from a vase, she found herself glancing out of each window, her view of him coming and going, her perspective on him a bit different from each vantage point. He was like a man inside a kaleidoscope to her, fractured bits and pieces coming together and moving apart and then coming together again in a slightly different form. Every Tuesday, Jenn from A Daily Rhythm hosts Teaser Tuesdays at which time participants grab their current read, open to a random page, and share a couple or more "teaser" sentences from that page while avoiding any spoilers. Then he smiled and his entire demeanor altered, an actor slipping into character. Somewhere deep inside her, Miranda recognized that he was giving a performance, and yet she did not care. It didn't seem to matter. She was willingly transfixed by the play. I found North of Here . . . unexpected. The above description is a fitting one, but the novel took a turn I hadn't expected--I feel it's safe to say that without spoiling anything. This really is a novel about the characters in many ways, about the way their lives interconnect, and the consequences of their actions and inactions. Although it is never said, Miranda is clearly depressed, feeling helpless and lost after everything she has been through. Raised in wealth, she has never wanted for anything. With all that now gone, she is forced to re-evaluate her life, only she is not in the mental frame to do it. She doesn't know what she wants, not really. She isn't sure what she needs. Laurel Saville has created a character in which her feelings, her grief and sense of hopelessness, seem so very real. She is like a wounded bird you cannot resist but want to help. I liked Dix instantly. I am not at all like him myself, but I wish I was. He gets things done. He fixes things. He respects the land and lives a relatively simple life. People think of him as just another local, uneducated and simple. They would be wrong. He is the local handyman who goes out of his way to help Miranda, taking her under his wing. Perhaps his biggest strength and also his biggest weakness is that he takes things as they are and doesn't often ask questions or sweat the small stuff. While admirable on one hand, it makes one wonder if it also meant a lost opportunity or two. Then there is David, aka Darius, who is lost in his own way. Dropping out of college, he wanders aimlessly in search of a purpose. He stumbles on land and envisions building a life there--not just for himself, but for wounded people and troubled teens. Armed with the knowledge he has gained from self-help books and his own ego, he is sure he is the one who can save them. His good looks and charisma made me wary of him, but not so the other characters in the novel. Sally was more of an enigma to me. I did not much care for her at first. She is a social worker by trade, and owns the land Darius wants to buy. She decides to stay on in the house with Darius, saying she wants to make sure he pays the mortgage. Perhaps loneliness drives her initially. That and Darius's good looks. I was disappointed in her as the novel continued, in her complacency particularly. She isn't dumb. She knows how the real world works, is a bit hardened because of her experiences, and obviously has a heart. By the end of the novel, she redeemed herself somewhat in my eyes. As the novel progresses, the relationships of the characters evolve, and not always in the best or even expected ways. Perhaps this is what makes them so very human and real. You see Miranda's depression grow worse and her need to fill a void in her life grow. She ostracizes the one person who offers her a safe haven, turning instead to the false promise of The Source, the community Darius has put together which is made up of women and the occasional teen or two. The novel is told in third person, divided into three sections. The narrative winds slowly along at times and speeds up at others, jumping days and weeks ahead. This sometimes can bother me in novels, but I felt it worked well in this one. 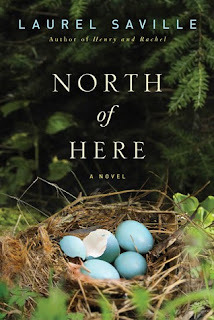 I found North of Here to be a quiet and unassuming novel, as well as quite compelling. I became emotionally invested in the characters and their stories. I have so many questions on finishing the book--about the characters, about the choices they made. I can see this one being a good one for a book club. There's certainly a lot here to discuss. To learn more about Laurel Saville and her work, please visit the author's website. She can also be found on Goodreads, Twitter, and Facebook. I hope you will check out what others had to say about North of Here on the TLC Book Tours route! Many thanks to the TLC Book Tours for the opportunity to be a part of this book tour. I selected this book as part of Amazon's First Program for Prime Members. The first paragraph didn't appeal to me, but as you described it, I'm now interested. Margot - I liked the writing in the initial paragraph myself, but admit it wouldn't be enough for me to go on if I had read that alone. What a beautiful review of what is obviously a very beautiful, touching novel! I love the way you analyzed the characters and plot! This is the type of book that doesn't have constant twists and turns, with lots of fast-paced action. It's obviously meant to be a gently-paced, thoughtful read. The "action" comes from the characters themselves -- from their ruminations and interactions. I agree that this would be perfect for a book club, as there's indeed much to discuss. Maria - Thank you! That is very nice of you to say. Yes, your description of this one is spot on--it's not fast-paced and it is a more thoughtful read. It was a nice change of pace for me. I enjoyed this one quite a bit and hope you do too if you read it. Cleo - I enjoyed it. I hope you will give it a try if you get the chance! I like the cover - it's lovely. I'm kind of on the fence about the book. As soon as you started talking about the 'charming' man, I was wary. Think I'd have to be in the right frame of mind for this one. Kay - The cover is what first drew me to it. So pretty. :-) Less charming and more smarmy is more like it--in regards to that character. That is such a pretty cover and the intro makes me curious to found out more about Miranda's situation. Diane - I felt so bad for Miranda. She was such a lost soul. This sounds like a really interesting book and I loved your review! The description at the beginning, of her kaleidoscopic view was what intrigued me immediately! I'll have to see if I can check this one out. Thanks for sharing :) I hope you have a great next week! Juli - Thank you! If you do read it, I hope you like it! I'd like to know more about these characters, so I'd keep reading. Catherine - It was such an interesting novel. I am glad I read it. I would probably pick this one off a book store shelf because of the cover and the blurb. Your review drew me in, so now it is on my list of books to go searching for. Thanks. Judy - I really like the cover too. :-) I hope you enjoy it if you d oread it! I recently downloaded this one, as a Kindle First book, but chose it because I've read a memoir by Saville and liked her writing. Laurel-Rain - It was the one I picked as my Kindle First book too. I haven't read anything else by Saville, but I'm curious to read her other work. Sarah - I imagine it won't be for everyone. Thank goodness for all the other choices available! The opening makes me wonder who she's watching. Is it the handyman? I'd keep reading to find out more. I enjoyed your observations about the story. Since I like character-driven books, this sounds like one I'd enjoy. My Tuesday post features THE ALL-GIRL FILLING STATION’S LAST REUNION by Fannie Flagg. Sandra - I really liked the author's writing style. I could tell you who she was watching, but that'd be a spoiler. ;-) If you do decide to read this one, I hope you like it. I wasn't hook by the opener but the premise is interesting. Beth - The opening doesn't tell you much, although as you go you get a better idea of Miranda's state of mind. This wasn't quite what I expected, but I enjoyed it. Beautiful cover, but not at all sure about the book. Jenclair - I don't know if you would like this one, knowing your tastes. The opening didn't really grab me and the blurb didn't either but your review did! I like that it was unexpected and that you were able to really relate to the characters. I'll have to check this out. Katherine - I wasn't quite sure what to expect going in with this one, but I did enjoy it. The opening didn't capture my attention at first but after reading your review I was intrigued by the story. This sounds like a characters-driven kind of book. Melody - Yes, it's more character driven, I think, than plot driven. Donna - I hope you will give it a try! Alas not convinced I'd enjoy this one, the GoodReads synopsis certainly too soppy for my liking. AND I'm slightly put off by the fact it jumps around like this. Tracy - I didn't find the book soppy at all. But I also think the description is a bit misleading. I imagine this book won't be for everyone. And knowing a little of your tastes, I think you'd probably be right in thinking you might not take to this one. Thank you for the beautiful, thoughtful, generous review of my book! Laurel - Thank you so much for your kind words! I appreciate you stopping by. Reading the description, I would think this book was very predictable, but now you have me wondering. Paulita - The description had me thinking it might be too, but it wasn't at all. I'm not sure about the opening, but your review grabbed me! I'm glad you enjoyed it. Diana - The opening isn't an instant hook, I agree, but I did enjoy this one. This sounds of interest from reading your review. The photo of the cover you show reminds me how important book covers are, this one with the blue eggs in a nest is a beauty and if I saw it in a book store I would pick it up and think about buying it. Terra - I like the cover quite a bit too. :-) It fits the setting quite well, I think. This one does sound very beautiful. I wouldn't have said that this is for me but your review makes me want to check it out. Athira - I am not sure what initially made me say yes to reviewing this one, to be honest. I am glad I did though. This book is new to me, it sounds kind of like an emotional read. I am kind of intrigued by the teaser, is he slipping into actor mode and her not caring a good thing or a bad thing?! Haha. Cyn - It is an emotional one. Sad in many ways, but there is also some hope. A reader becoming emotionally invested in the characters shows me that the author knows how to connect with readers, and I really appreciate that. Heather - I agree. I think the author was able to do that well. Oh this sounds like a great love story with lots of highs and lows. Thanks for bringing this one to our attention!